Ah, those creatures we all love, more or less. I have posted about lots of them in the last months, but only few of them have remained faithful to us despite the harsh Winnipeg winter. 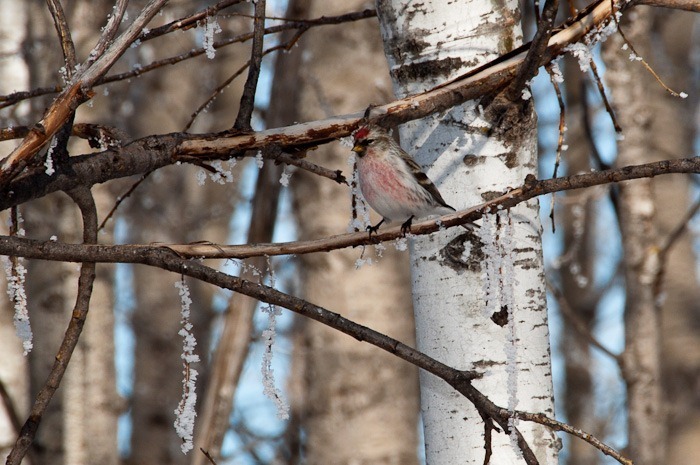 birds, they have stayed here, accepting the cold and the frost of the Northern Winter. Ok, enough about that harsh weather for this season. If this ever cools down a bit we can say we’ll have had a winter . But they have stayed, whatever Mother Nature would have thrown at them. Some people didn’t want to wait for this and left for warmer climes, without waiting for the cold. 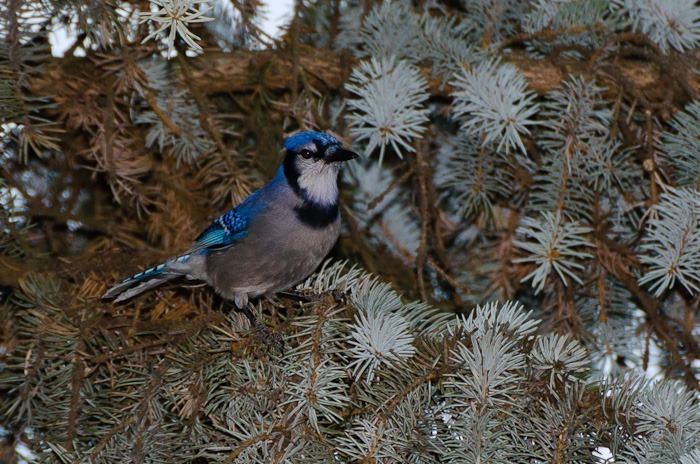 This Blue Jay, for example, comes every day to my balcony asking for peanuts with its shrieking “jay-jay”. And so he and his mate get the peanuts. 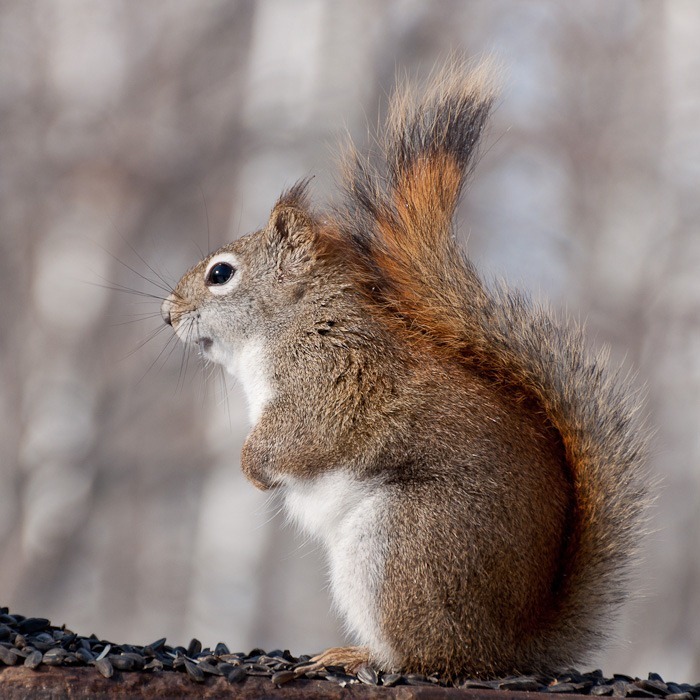 They carefully select the ones they like and leave the others for the squirrels. 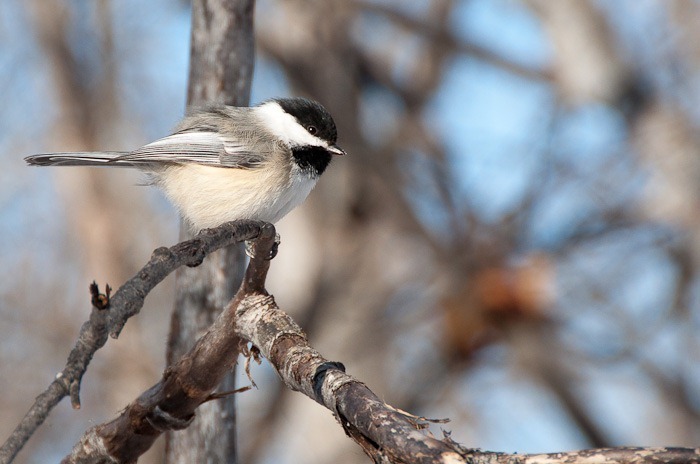 Then there are the Black Capped Chickadees. They stay here all year long and only move away in case there is really nothing left to live on. For many of them it is too late, by then. But this year, they have nothing to worry about. There is plenty of food in the feeder on the balcony. 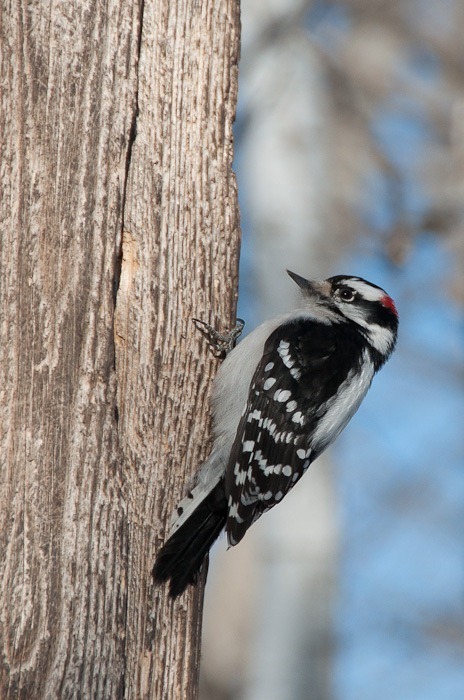 The Downy Woodpecker also doesn’t leave unless he has to. Hacking away on the peanuts in the feeders and on the wood in the parks, he is still capable of finding himself enough food to remain fat and fluffy. 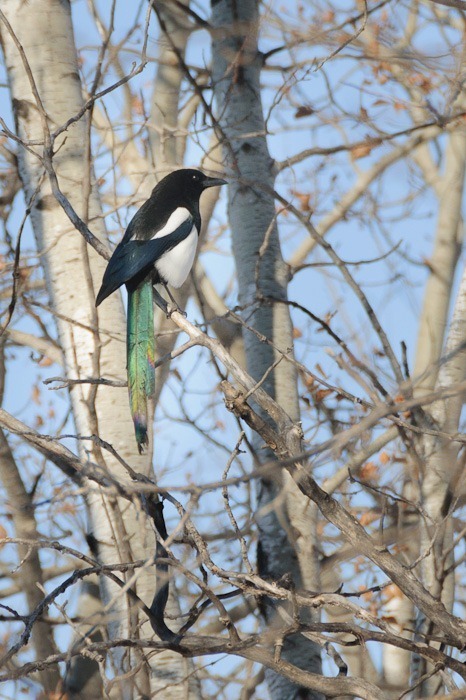 An unexpected creature for my camera was this Magpie, brilliant in black and with a beautiful iridescent tail. Under any other angle, that tail would have looked black as its head. This is a very skittish bird and is not easy to photograph in its natural environment. And then, suddenly arrived new birds. They come from the North, thinking that the South is warmer at this time of year. In Manitoba they are only migrants, they breed in the North in spring and summer. 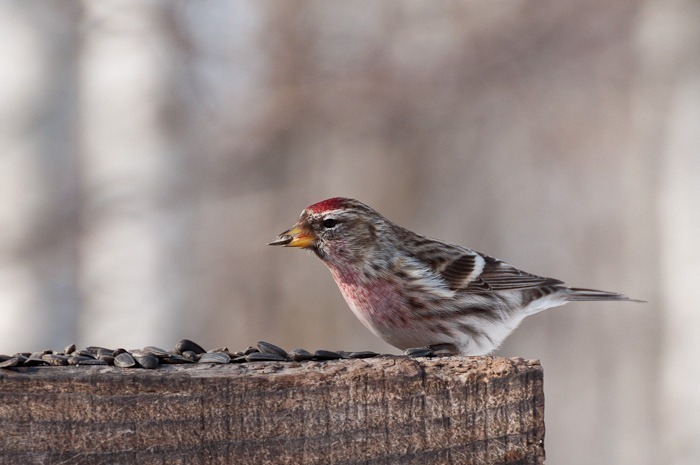 The Common Redpoll is a beautiful bird, female as well as the red coloured male. Usually birds don’t mix too much around feeders, but they don’t seem to mind the presence of the (already present anyway) Chickadees. 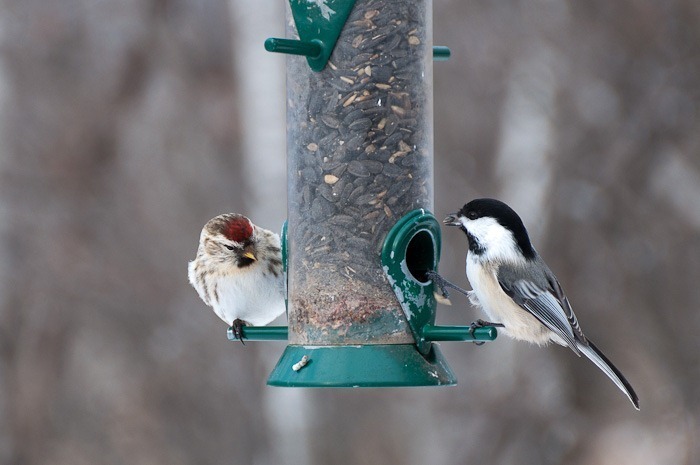 Dinner for two at the feeder? No problem. As long as each stays at his own side of the food! 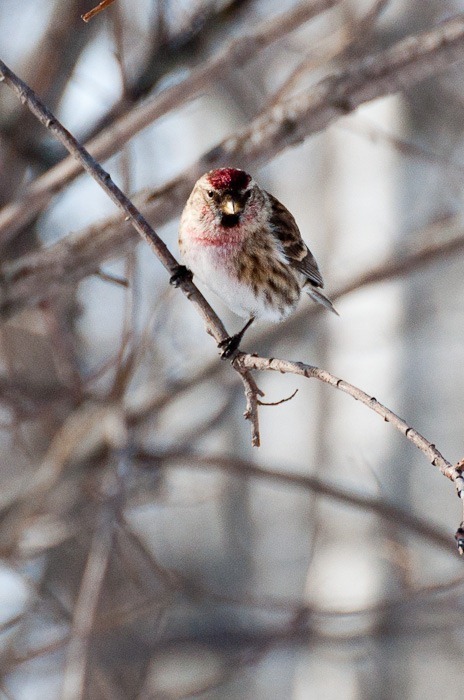 At first, the Redpolls did not want to come closer than about 10m away from me. But I guess that the number of photographers trying to get a picture of them while keeping them away from food have made them a little tamer. Tame enough to get some better shots of them, without having to crop the pictures down to a few pixels. 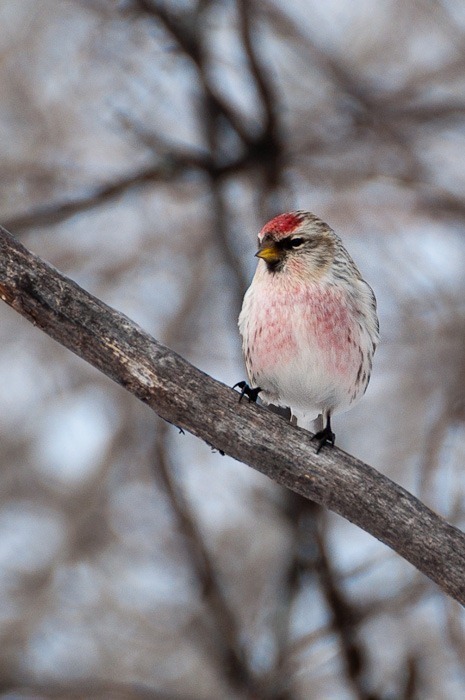 And although many Redpolls seem to be big and fluffy, some still remain a bit thin. Even if there is enough food around. But I guess that the creature from the lead picture in this case is not innocent to this meagreness. Every time there are lots of seeds on this beam, the squirrel and his mates are up there trying to get as much of the seeds as they can. Chasing away the birds in the process. 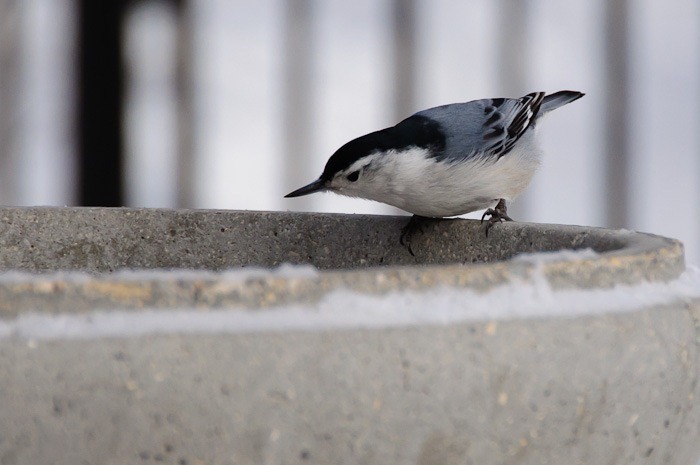 The White Breasted Nuthatch, in a different Park in the City also stays year round. Looking for nuts, insects and other food in the parks. This one is looking at a bowl plenty of sunflower seeds. Difficult to choose when there is so much to eat, eh? They are still here, those little creatures that keep us, photographers going out in the cold to get a nice picture of them. So, photographers, if you come to think of it, why not take some bird seed in your big camera bags? A few peanuts for the squirrels to keep them away from the birds and you’re in for a treat!